The trombonist's superb quintet is now both more political and more lush in arrangement. One of the music's best bands just got better. 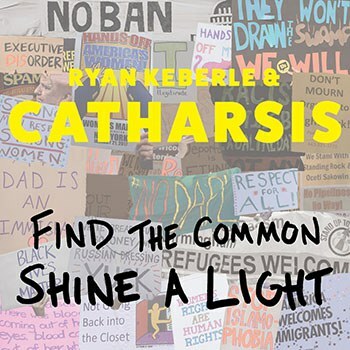 Find the Common, Shine a Light, trombonist Ryan Keberle's fourth recording with his band, Catharsis, is a web of melody, assertion, and texture. This is the group’s most lush and complex set of arrangements -- and possibly the bands’s most easy-to-love outing -- yet, and the impact of the music has been amplified by the layers that make it so lovely. This is a protest album, a reaction to the politics of the United States in 2017, but leavened with optimism. Both lyrically and melodically, the songs surge toward hope more than despair. “Become the Water” begins with a set of beguiling chords on Fender Rhodes that are cushioned by the band’s trademark orchestration of trombone, trumpet (courtesy of Mike Rodriguez) and wordless vocal (courtesy of Camila Meza). When Meza does provide lyrics, they allude to a famous Bruce Lee quote (“Be the water”) and to a famous David Foster Wallace graduation speech (“This is water”), both of which argued for more compassion and selflessness. “Our weakest link is fear of losing greatness”, she sings, asking why we can’t find common ground and “put out the fire”. Another hopeful yet topical and on-point song is “Al Otro Lado del Rio” (by Jorge Drexler and known to folks in the U.S. for its use in the film The Motorcycle Diaries), which narrates a hopeful journey rowing across a river. Lyrics like “I think I have seen a light across the river” evoke immigration to the United States, perhaps, but they also echo in sync with the title of the album. Other songs with lyrics are more pointed, perhaps, though they aim at a target only indirectly. The band's take on the Beatles’ “Fool on a Hill” astonishingly and subtly recasts its harmonies so that we hear it anew. They also reimagine Dylan’s “The Times They are A-Changin’” as a quizzical chamber-jazz song that acts as a warning: get up on your game now, people, because this moment matters! “Come senators, congressman / Please heed the call”, Meza sings gently but with the band rising and gathering behind her voice. The last song with a set of lyrics is a cover of “I Am a Stranger” by The Welcome Wagon, a gospel-ish indie band from Brooklyn. It's a tune in looping 5/4 and narrated by a person who is “cold and dark within” and who admits, “From what I hate / I can’t refrain”. So yes, this may be a record about President Trump. The other half of the tunes are set without lyrics (yet Meza’s enchanting wordless singing stands as one of the lead instruments). Three of these tunes are gorgeous, brief, and controlled collective improvisations titled thematically: “Empathy”, “Mindfulness”, and “Strength”. The brief “Empathy”, for example, is the purest sound the band makes, with the three melodic lines winding around each other in tonal improvisation while the rhythm section provides minimal groove beneath the themeless acrobatics of the voices. This work is built around the Catharsis core: Eric Doob’s drums, Jorge Roeder's bass, and two brass voices in woven interplay with Meza. For several songs, however, Keberle has added Meza’s sophisticated electric guitar, more frequent use of electric bass, and his own coloring on Rhodes and Melodica (the small keyboard you blow into, which sounds a bit like an accordion or harmonica). Additionally, the band uses more overdubbing to create layers and conversations within the arrangements. The result is a quintet that is starting to sound more like a small orchestra. “Ancient Theory” exemplifies this expanded band. Meza sings the lead in unison with her guitar at first, while the brass pulses harmonically. She strums behind Keberle’s portion of the theme; he comps on his Melodica behind Roeder’s electric bass solo while she fills in on guitar, accompanying Rodriguez’s lyrical improvisation. When Keberle gets his turn, the guitar is supplemented by stacked, overdubbed vocal harmonies. It’s not quite Phil Spector level production, but it’s close. A more minimal use of the extra colors characterizes “The Times They Are A-Changin’”, with a ringing Rhodes pattern interwoven with acoustic bass and guitar. Once the horns come in, the subtle accumulation of simple patterns amounts to a beautiful tension. The pairing of Rhodes and electric bass on “Become the Water” achieve a similar effect, with the additional weight of doubled vocals and overdubbed horns. It even ends on an ingenious a cappella chorale of the tune’s chorus. Finally, Find the Common, Shine a Light is a superb album to listen to in sequence. It is a beautifully modulated program in which the more lushly orchestrated tunes are like tentpoles that boost the roof around the free improvisations. While the star of each tune tends to the astonishing melodic/harmonic interplay between Keberle and Rodriguez (which has always been Catharsis’s special sauce), this outing demonstrates how much more powerful that conversation is amidst arrangement that can lean on several different strengths at once. Though it may be political, Find the Common, Shine a Light has reach. It moves Catharsis from an appealing band with a brilliant single idea to a group that can do just about anything. Keberle seems to know that he’s got something great in this band, so bring prepare your ears for a very good time.